Apologies for the lack of blog-action over the last couple of weeks, work and other commitments has meant little time to visit Druridge and even less time for blogging and it isn't going to get any better over the next two weeks. 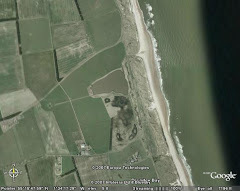 To make up for long-days, I took a half-day today to get the nets up at Druridge. Ringing was slow, catching ten or so warblers, sedge, willow, whitethroat and blackcap. We bumped into Mike Hodgson, he spotted a cuckoo flying over the road, first at Duridge this year, I remarked "hope it's flown into out net" - well it did. Ageing and sexing it has proved somewhat tricky however. We are sure it isn't a juvenile or an adult male. 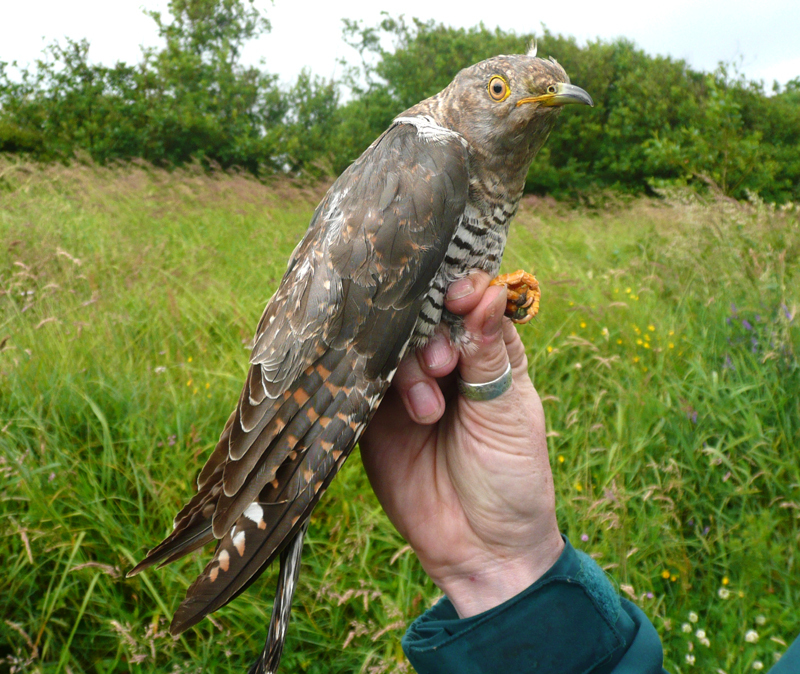 Which leaves the female, which in cuckoo comes in two morphs - grey, very much like the male, and brown or rufous. 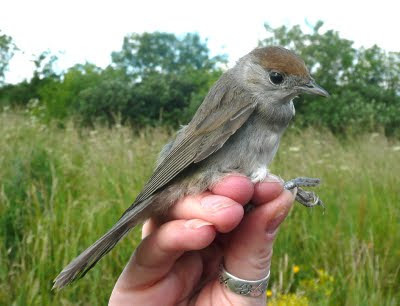 Our bird showed some of the characteristics of a brown morph female but not all, more like something in between. A trawl of internet images hasn't helped much, other than apparently ruling out a juvenile due to the lack of white fringing on the upperparts. Looking at Collins, the brown morph is barred dark/rufous brown and the upper tail/rump are also rufous brown, our bird had a grey/brown uppertail and rump. This bird http://www.pbase.com/charlie_fleming/image/113357739/large has a grey/brown uppertail. 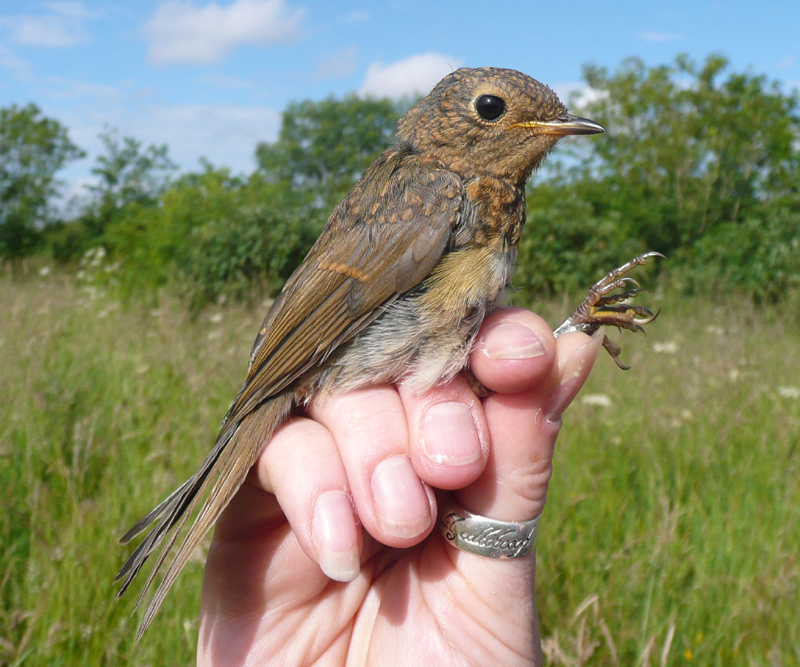 This one closely resembles our bird and has been labelled 'hepatic morph female' http://www.flickr.com/photos/nigelblake/3118599073/. Seemingly there is much variation - Any thoughts? This is the second cuckoo caught and ringed at Druridge, Janet caught an adult may here in July 2007. This one was a ringing-tick for me. 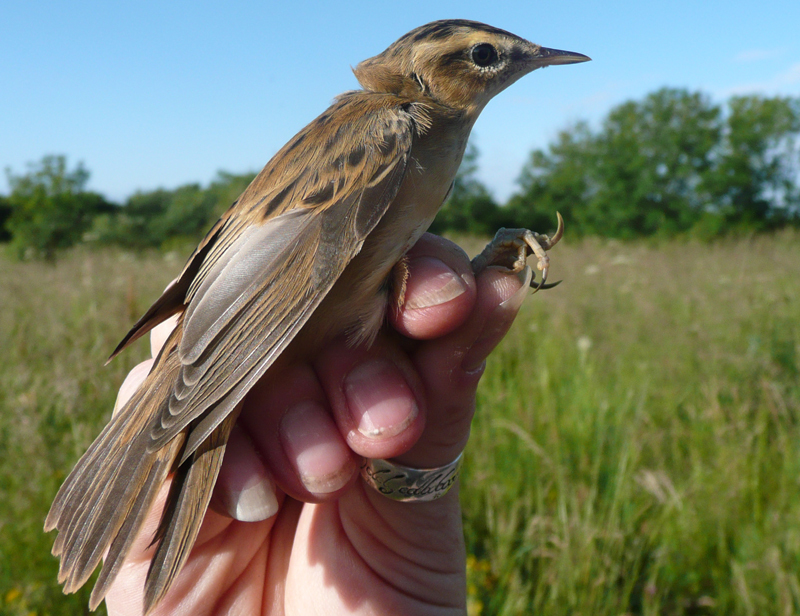 Here are a couple of other photos from today's ringing. 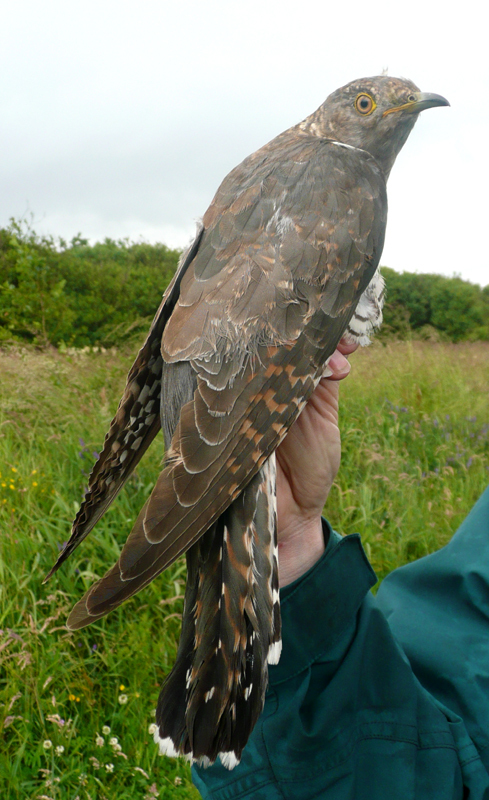 Other highlights today, Janet saw an adult hobby at close quarters, before it headed towards the dunes then south. I was checking the nets at the north end... There was also an adult merlin hanging about - I always think that mid July is a good time for merlins on the coast. Last night, about 8.30pm, the sea was like a millpond, with a light pink sky as the sun started to set. I was watching a 'gang' of arctic skuas harassing the terns on their way north to Coquet Island - I counted at least six by the end of the night. The highlight was mammalian, rather than avian - a pod of white-beaked dolphins about half-way out, visible with the naked eye because the sea was so flat. At first they were in a tight group, with much activity, before spreading out over 300-400 metres. Amazing! yesterday I had both green and wood sandpipers on the big pool and on Saturday evening I watched a little egret going into roost in the heronry -amazingly, my first of the year! You couldn't just trap a normal run of the mill Cuckoo could you!! re the cuckoo. I've just sent an e-mail to your Hotmail account. See what you think. Alan - didn't get your email? some suggestions that it is a '5' - ringing speak for born last year calender year. They don't breed in the first year, so it has come all this way just for a look about. 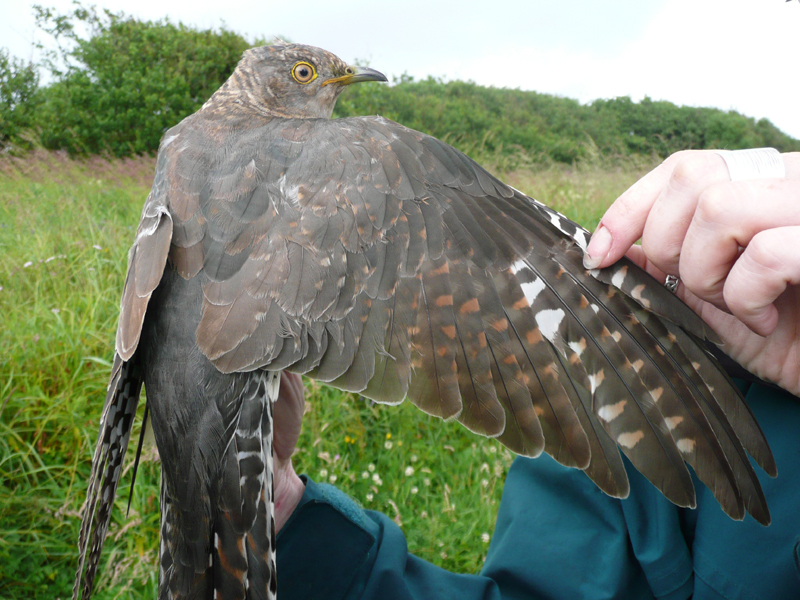 Moult in cuckoos isn't straightforward...It may have retained some juvenile feathers (brown) and grown some adult grey ones?? I've forwarded it to your other address.